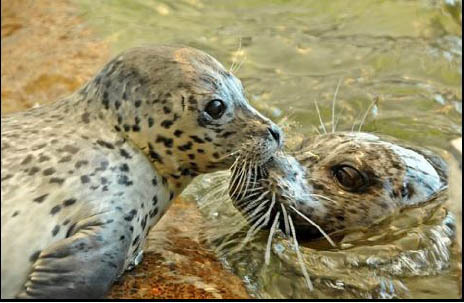 The Seaside Aquarium has a long-standing history of breeding harbor seals. 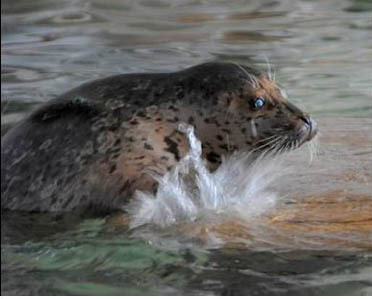 Since 1952, harbor seal pups have been born in the Aquarium from captive-bred parents. This spring the Aquarium welcomed a boy and a girl to the resident herd and summer visitors were able to watch the growing pair adapt to their home. 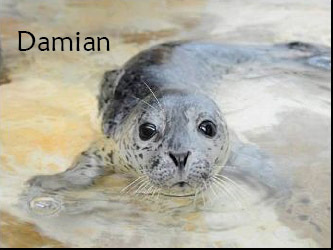 Greta gave birth to a male on May 23 who was promptly named 'Damian' after the Portland Trailblazers� Damian Lillard. Scully�s pup came a week later on May 31st. 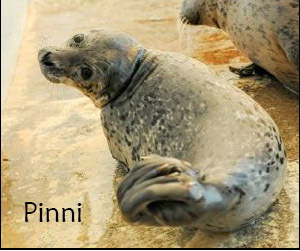 Her name, 'Pinni', is a shortened version of 'Pinniped', the suborder that seals and sea lions belong to. Pinni and Damian�s mothers Scully and Greta have different parenting styles. 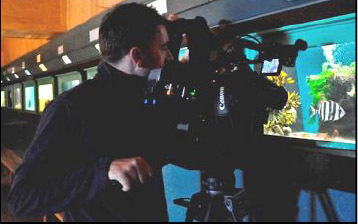 Greta is a 'hands on' mom who stays near Damian as he navigates the tank. Scully is no less attentive, but she does it from a distance. She is there instantly if Pinni needs her, but she also allows the pup to explore on her own. Scully spends much of her time after-hours swimming in the main tank, while Pinni prefers to hang out in the pup tank. Although their styles differ, they are both great mothers. Damian gives a good attempt at a splash. He is still working on his catching skills. Scully checks on her pup, Pinni. Touching noses is a common form of imprinting for mothers and pups.